Up until a few years ago, I never really put thought into what I carried around with me every day or why I carried it. Now I have a loadout that suits my needs and I wanted to share some of the things I’ve learned along the way. 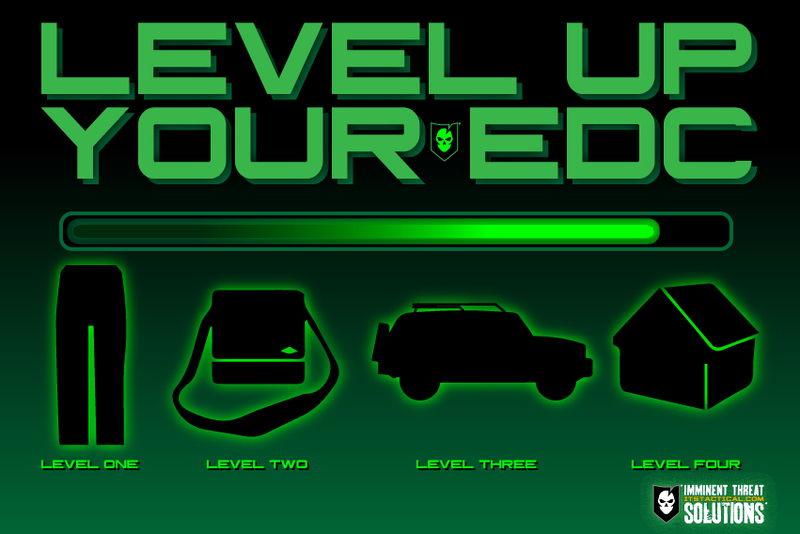 This is mainly focused on a Level 1 EDC, but several of the principles can be applied across all levels. It’s easy to look at “celebrities,” retired members of the Military, or someone with thousands of YouTube subscribers and think, “Oh, he carries (X), I want that!” Rather than this train of thought, you need to find items that work for you. Items that fit you and work well in your environment. 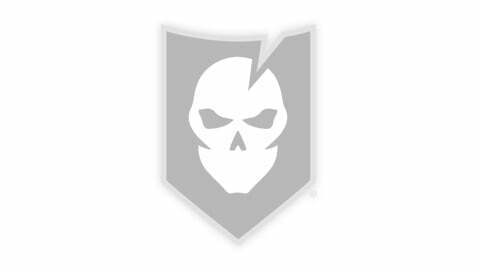 What works for a SEAL in Afghanistan might not be the best fit for you. For me, an example of this is appendix carry. I love the idea of carrying this way, as it makes concealing and drawing very easy, but I’m a big guy and it’s very uncomfortable. It just doesn’t work for me, so I don’t carry that way. Also, you need to decide what you want to get out of a particular piece of gear. Do you want an external safety on your carry gun? A single stack or double stack mag? How many lumens do you want on your flashlight? Do you want an automatic opening knife or a regular folder? Based on your reasoning and research, figure out what you want and get something that fits those parameters. Do I Really Have a Use for This? One of the most important questions you can ask yourself when deciding on what to carry, is whether it’s useful or not. 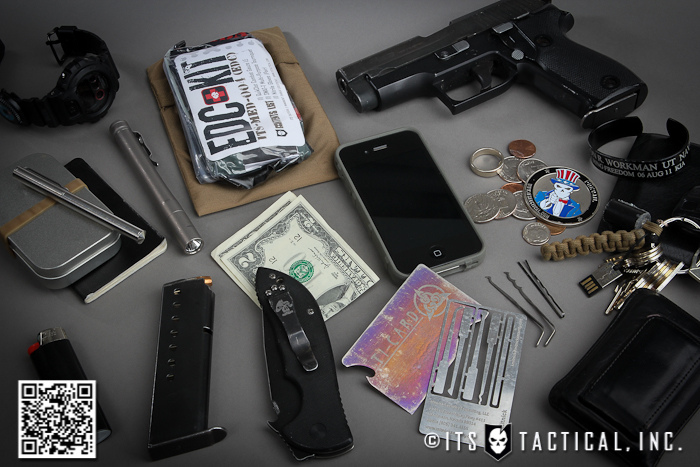 Before you add something to your loadout, ask yourself, “Do I really have a use for this, or is it just something cool to have in my pocket?” There’s no point in carrying around something you don’t have a use for. Try to find single items that have multiple uses. A good example of this would be a Leatherman, or a knife that also has a glass breaker on it. Items like these will help save valuable real estate in your pockets. Don’t be afraid to try out different items. 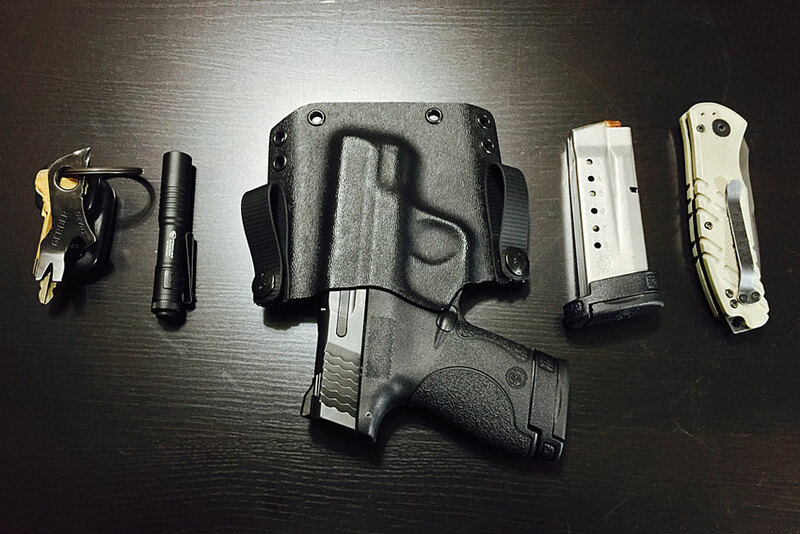 You may buy three of four great holsters or flashlights before you find the one that works for you. 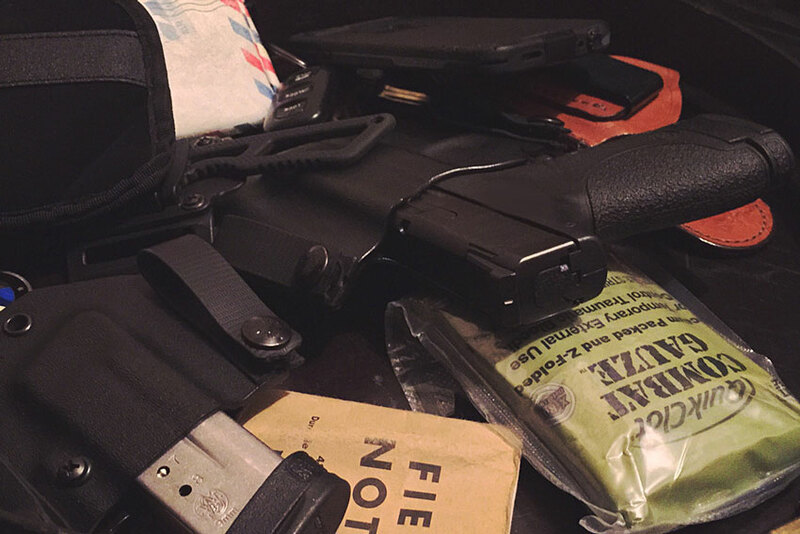 Fortunately, there’s a market for used gear like holsters, flashlights and other items. So if you don’t like something, put it on eBay, resell it and get something else. 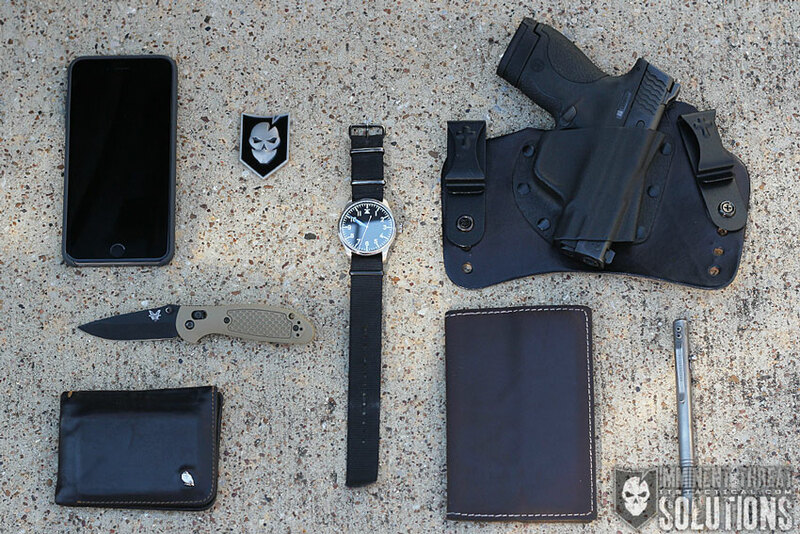 Everyone knows the old saying: “Two is one and one is none.” Be careful with this mindset when it comes to EDC. Would it be nice to always have a backup for everything I’m carrying? Yes, but that’s not practical for me in everyday life. If you buy quality gear, it’s more likely to work when you need it and you won’t need that backup item. A reliable pocket flashlight can be an invaluable tool at times. Whether you’re walking to your car in a dark parking lot, or assessing a potential threat in a low-light situation, a flashlight can be a great asset. I specify “Non Weapon-Mounted” because while a weapon-mounted light can be a great tool in a low light shooting scenario, it can be dangerous if used during everyday tasks. With a weapon-mounted light, every time you point the flashlight at something, you’re also pointing the muzzle at it. This can be very unsafe and get you into some serious trouble if you’re not justified in also drawing your firearm. Check out this article on ITS for more information on every day carry defensive light usage. I know that this is a given for most of us, but don’t leave home without it. Don’t leave your cell phone in your car when you’re running into the gas station. It should always be on you. Your phone is an endless resource of knowledge, a lifeline to call for help and a great way to keep up with current events as they are unfolding via social media. Also make sure your phone is in a solid case that will protect it from accidental drops and weather. A Lifeproof Case is an excellent choice. It’s pricey, but I believe it’s a worthwhile investment. There are several law firms offering coverage for responsibly armed citizens. Basically, you pay a subscription every month to be a part of their program and when/if you are involved in a defensive shooting, they provide an attorney to represent you in civil or criminal proceedings. I am a member of Texas Law Shield and would highly recommend them as they have excellent customer service. Maintain a good level of situational awareness. (This means don’t walk around with your eyes on your News Feed all the time.) Be aware of what’s going on around you. Have a good working knowledge of your gear. 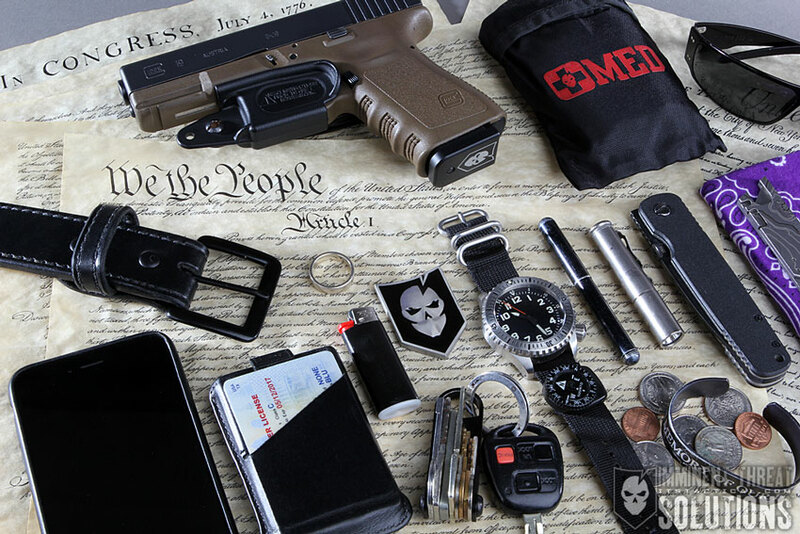 Know how to clear malfunctions in your firearm and how to use your trauma kit if you carry one. If not, why don’t you? Train with what you carry. Be consistent in what you carry, don’t switch out your gear all the time. Of course things can change as frequently as the weather, or different dress codes, but try to have consistent loadouts for each situation. Figure out what works for you when you wear a suit, heavy clothes in the winter, or shorts and a t-shirt in the summer and stick with that. Be in good shape so that you can run when you need to run and fight when you need to fight. Let’s be honest, we all love gear. We love velcro, tactical pants, morale patches and coyote everything. Unfortunately in a public place like a mall or restaurant, these things can make you stick out like a sore thumb. Most likely, “tactical” is not “practical” in your everyday life. Wear regular clothes and be a regular guy until the situation dictates otherwise. Editor-in-Chief’s Note: Matt F. has worked in Law Enforcement/Corrections for 5 years and is a Defensive Tactics Instructor for his department. He is also an avid musician.